There's something about the Cthulhu mythos that simply sets me on fire. I can't resist it, maybe it's the latent tentacle monster in me, but anything based in or around the realms of any H.P Lovecraft works gets me about as excited as a cultist summoning Daoloth for the first time without proper eye protection. 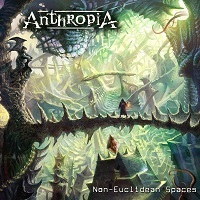 You can imagine my excitement then, when I learned that the new album from Franco Prog-Metallers ANTHROPIA is entirely based on the Cthulhu realms and the many Gods and themes contained within them. I'll try and be as impartial as I can though, despite the bloodthirsty cultist that just wants to scream at the moon and find another one of the neighbours cats to sacrifice to Shub-Niggurath. The album opens up in an almost bliss like way with “Strange Aeons”, and through some beautiful guitar work and some very well done sound design, it sounds like it could, quite happily, be the opening of an OPETH album. The peace is broken pretty quickly though and a very familiar tone tears into place as “The Melancholy Of R.C” sets the tone for the rest of the album. One of the things that I love about this album is not that it's just based in one of the best universes of all time, but that it is a clear, tangible story through this world. The album follows the steep descent into madness of Raymond Carter as he develops his psychic dreams and discovers that Cthulhu and the Great Old Ones are coming back to reclaim the Earth. This is something that's missing from so many albums these days, a decent narrative to the thing; a story that you can actually latch on to and care about. And tentacle based Gods. The musicianship throughout this sonic story is fantastic; guitars that sing as well as either of the vocalists and drums that don't just sound like they are pounding an endless rhythm worthy of the blind idiot God. I barely made it past “Silver Twilight Lodge” before I shat myself. The bass-line that pumps its goo all over the song is so dirty that I had to have a quick bath in bleach before listening to the rest of the album. It's definitely worth mentioning that this is one band that utilizes dual vocalists in exactly the right way. There is no cringe inducing Shakespearean vocal duals or over harmonising. Nope, rather there is just perfect balancing between male and female vocals, with both being well thought out and neither becoming too much to bear. The whole album progresses very steadily, and although there are a couple of tracks that maybe weren't as good as the others, I would happily say that this is one of the best Prog-Metal albums I have heard for a while. Maybe I'm biased, maybe it's just Nyarlathotep speaking through me to find more devotees for the cults.